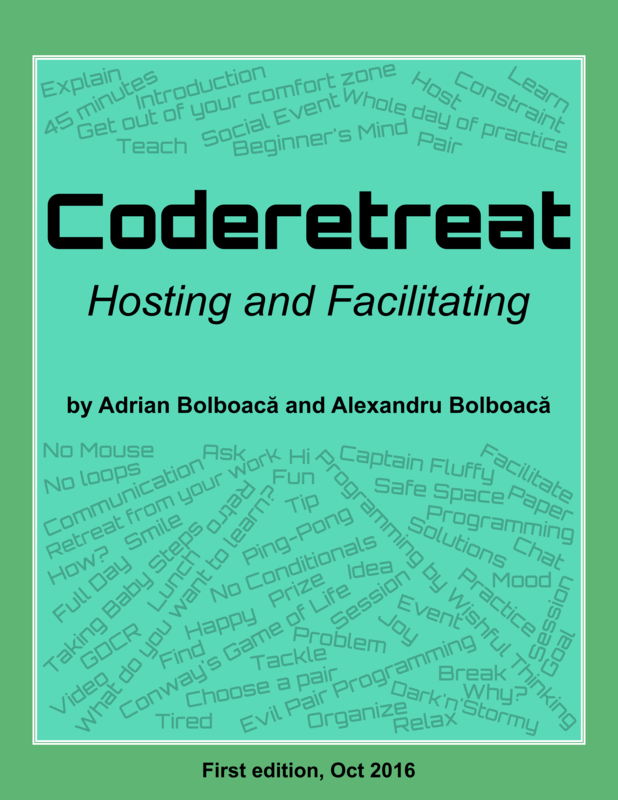 A couple of weeks ago I published the Coderetreat book together with Alex Bolboacă. The book is about how to facilitate and host a coderetreat event. It contains plenty of ideas and advice from both of us, based on our experiences of organizing, hosting and facilitating many coderetreats the least 7 years. The book contains specific advice on how to host and facilitate. Also a list of sessions is available in the book. Each session is documented in detail. This is the first edition of the book, and we launched it now especially for the Global Day of Coderetreat (GDCR) 2016. We hope this book will help hosts and facilitators have wonderful events around the globe during GDCR. We plan to enhance the book with more chapters and more sessions. For now just enjoy the book and we hope we will receive plenty of feedback from you. We want the book to help you if you are organizing, hosting or facilitating a Coderetreat. Please tell us if it helped you, or how we could improve it for you. Thank you!